This past December, the West Elk Hockey Association U14 Lady Blades attended the Adele Dombrowski Tournament in Steamboat Springs. They swept the four-game tournament, taking home the championship trophy. 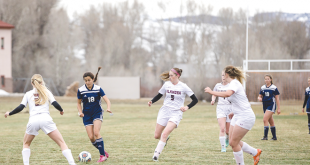 Ever since then, the girls have had their sights set on improving their game and making it to the Mountain States Girls Hockey League state tournament in February. Over the course of the past three months coaches Molly Cannon, Christian Cavarra and Heather Messner have worked hard preparing their team for league play. The Lady Blades have played 12 games and finished with an 11-0-1 record in the MSGHL. 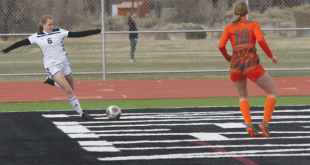 The girls wrapped up league games in Santa Fe this past weekend, winning both games 7-0 and 9-1. Throughout the season the U14 girls have put a staggering 72 goals in the back of the net and have allowed only six in their own. The U14 Lady Blades will enter the MSGHL state tournament as the number one seed, which is scheduled for February 20-22 at the Edge Ice Arena in Littleton, Colo. The team’s goal is to bring home a state championship.